If your business accepts payments online, you usually require a payment service provider. 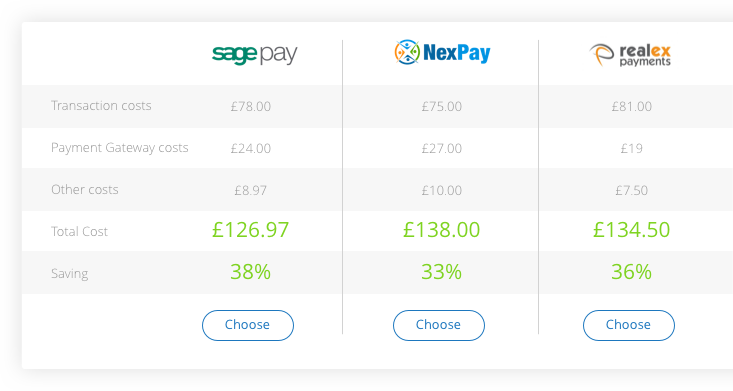 At Cardswitcher we compare the top payment service providers, finding you the best deal and saving you up to 40% on your processing fees. What are Payment Service Providers? A payment service provider is an institution that provides an online payment framework and allows businesses to accept debit or credit card payments online. With Cardswitcher you can save up to 40% on your payment processing fees in just two minutes. We work in partnership with the best payment service providers on the market. After you tell us a little about your business, we generate quotes from each of our providers and show you which deal is best for you. It’s quick, easy and there are no obligations at the end. Explore the inner workings of the payment processing industry. Learn about how Cardswitcher works and see how we find you the best deal. Discover how payment gateway providers move money from your customers’ bank accounts to yours. Compare debit and credit card processing fees and save up to 40%. Since launch we have been trusted by thousands of SME merchants to reduce their costs through the quotes we have provided. These quotes have demonstrated the millions of pounds each year which could be saved by these merchants through switching card processing suppliers. Challenge us to save you money - we can for over 65% of SMEs who get quotes!